So you want to beat a raid with no one on your team dying. Cool. It’s not easy, but it is definitely possible. Crota is short and thousands of players can beat it solo. With a small group, you should be able to tackle it without too many problems. Considering it is much shorter than the Vault of Glass, it is less frustrating to lose right at the end. If you and your group are frustrated from trying to get this trophy or achievement, this guide should help you out. Before I start, keep in mind this is not the only way to do this. It is simply what has worked multiple times for the groups I’ve run with when trying to get Flawless Raider. If another method works for you, share it below. It may seem counterintuitive, but the less people attempting, the easier this trophy will be. I recommend three, but if you have a group of two or four that you think can pull it off, then go for it. Just remember, the more people you have in your group, the more potential for silly mistakes that can cost you a perfect run. Now, for specific classes, the only solid requirement is a level 32 or higher Hunter with a maxed out Bladedancer subclass. Every invisibility perk should be selected (particularly Escape Artist, Stalker and Shadowjack) as it will be used in three of the four major sections of the raid. This hunter will solo the pit, cross the bridge and be swordbearer against Crota. The other players can be any class, but I highly recommend Titan or Warlock. Since the Warlock cheese method does not work without self-reviving, it can’t be used for Flawless Raider. Instead, Titans and Warlocks can climb to the top of the left tower, where they are out of bounds and will trigger the despawning much like the Warlock cheese. All of the other players should be at least level 31, or they will not be able to take down Crota’s shields fast enough for the Hunter and will die too easily. Equipment-wise, the Hunter should have Don’t Touch Me, which causes the player to go invisible when hit by a melee attack. While it isn’t required, it has helped me on many occasions stealthing the pit and surviving while trying to open the bridge. A good rocket or sniper to take down swordbearers is required, preferably Gjallarhorn, Black Hammer, Icebreaker, or something similar. A Crota primary weapon with Hive Disruptor will help a lot when clearing the knights after killing Ir Yut. The other players should also have Gjallarhorn, or at least a rocket with tracking for Crota. Any Titans that aren’t crossing the bridge also need Icebreaker or Black Hammer to snipe the ogres. All players should be stocked up on heavy ammo synthesis. The Pit: In the pit, everyone except the Hunter should sit down in the starting spot and go make a cup of tea. The Hunter will solo this first part to minimize the chance of people getting in their way. Before running out, crouch and get invisibility. Sit at the first lamp as long as possible until the darkness effect goes away, then jump onto the lamp, crouch to go invisible, and run to the next lamp. Keep repeating this until you reach the bridge. Once there, trigger the final lamp and then step on the plate to build the bridge. Wait until the lamp explodes then jump onto the rock to the left of it (the dark one in the image, just next to the reticle.) Sit there until the ogre spawns and snipe it. Keep watch for more ogre spawns, as up to three may spawn. Once the bridge is built, run to the light and the rest of your team will appear in the second phase. The Bridge: For the bridge segment, all Hunters will have to cross the bridge, while the Titan and Warlock players can climb to the top of the tower. To get onto the tower, respec your characters to get the highest amount of agility possible. Use a weapon with the +2 agility perk if possible (Icebreaker has it.) There are two spots on the cliff you will jump to before being able to reach the rim of the tower. Go up the stairs and all the way around the far tower from the spawn. The first spot is a V-shaped ledge that is a bit hard to spot on the farthest end of the tower. Once you are there, jump up to your left onto a flat rock. Walk to the highest point on the rock and simply jump straight up to the tower. Watch this video if you have trouble finding where to jump. When the players are up there, they can snipe the Swordbearer to help the Hunter with timing and protect them from thralls. Note that it is possible to jump across the gap without building the bridge, but I never was able to consistently do it with the Hunter. Because a Hunter is required in all of the other parts of this guide, it is better to play it safe and build the bridge. If your group can safely and consistently jump the gap, do so. After everyone is on the tower, the Hunter will start the bridge. This is arguably the most difficult part of the raid, as the Hunter will have to build the bridge on their own without triggering the Annihilator Totems before killing the Swordbearer and grabbing the Sword. Alternatively, the other players can stay on the totems to help build the bridge and then go on top of the tower. Do whichever your group finds easiest, as the people on the Totems are at risk of being attacked by the Swordbearer. Once across, the Hunter will hide behind the lamp on the left (the one in the image.) Just crouch and wait for the other players to kill the ogres. The snipers should kill any thralls that get too close to the lamp as it is possible for them to attack. Once the ogres spawn and are killed, the third phase will begin. The Hall: The biggest danger in the thrall run will be the cursed thralls and the Shriekers. Just take it slow, run back outside after each Shrieker is slow, and avoid the the cursed thralls. Once you get to the end of the hall, have one of the Titans or Warlocks jump over the enemies, careful not to land on a cursed thrall. The Crystal: For the rest of the guide, left and right will be referenced from the perspective of looking from the crystal room towards Crota’s platform. 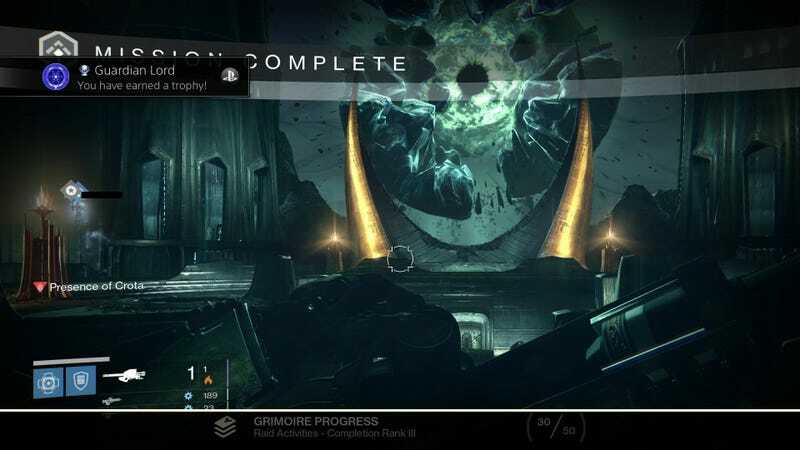 The Deathsinger segment and Crota both will run the same way as a normal raid. All players will go to the left first Have all of the players run up to the second floor of the towers on the opposite side, except for one who will lure the Wizard out. Take out the Wizard with rockets or snipers, then have someone with Gjallarhorn run in to kill the Shrieker. A level 32 should kill it in one shot, but a level 31 will need to follow up with primary or sniper shots. At the same time, the rest of the team should switch sides, with one luring the Wizard. Kill her and the Shrieker, then regroup in the tower. Kill the Knights immediately in front of the door, then move forward and carefully clear as many enemies out as possible before the 30 second counter begins. Once that happens, all players should run in and blast Ir Yut with rockets and sniper fire as fast as possible, then run back to the tower to regroup again. Kill all of the remaining enemies (make sure to take all of them out, don’t leave a single one,) and all that will be left is Crota. Crota: Again, you will use the same strategy on Crota as a normal run. If your team has a way to consistently beat him without anyone dying, then use it. Otherwise, after starting at the crystal, everyone should hide in one of the nooks between the doors or up against the window by a pillar. Clear all of the enemies, and regroup by the pillar in front of the left door. On the Hunter’s mark, run outside and hug the wall to your right. The Hunter will stand on one of the pillars (seen in the photo above past the ledge, to the left) and wait for the Swordbearer to be killed, shooting it themselves if it isn’t too risky. The rest of the players will jump on the ledge in front of the window (also seen in the photo directly in front of the player) and shoot the Swordbearer. As soon as the sword drops, the Hunter will grab it, run to the right of Crota and sit on the lower of the two rocks up against the wall between Crota’s platform and the door (directly in the center of the image.) Crouch to activate invisibility and count down from three to help time the Gjallarhorn shot. They should fire at the same time as the Hunter turns invisible As soon as they fire, they should switch to their primaries to take down the rest of his shields. At the same time, the Hunter will jump up to hit Crota with the R2/RT attack. After the third hit, drop the sword by switching weapons, melee Crota to activate invisibility, and pick up the sword again. As soon as Crota’s orange shield drops, fire Gjallarhorn to take his shields down again. Once Crota stands for the second time, everyone will run back to the left door and hide by the crystal for Crota to move back into the middle platform. Repeat the same process, careful not to be hit by the Knights. If the swordbearer gets at least three heavy hits per drop, he should be dead before the second sword disappears.